LAS VEGAS – Tickets are now available for Prêt–à–Porter Las Vegas, a new show concept and vision for the fashion industry. Featuring this fall and winter’s fashions, Prêt–à–Porter Las Vegas will take place Friday through Sunday, Nov. 13 – 15, at the Rio All-Suite Hotel & Casino Convention Center, 3700 W. Flamingo Road. Dress for Success Southern Nevada, the show’s designated charity, will receive a portion of all ticket sales. Sending clothes down the runway for the inaugural Prêt–à–Porter Las Vegas event are: bebe (Galleria at Sunset mall), Coco’s Boutique (Galleria at Sunset mall), Dasie Haze Clothing, Eccoci (Boca Park), French Connection (Fashion Show Mall), Marshalls/TJ Maxx, JC Penney (Galleria at Sunset mall), Calvin Klein Performance (Fashion Show Mall), White House Black Market (Fashion Show mall), Francesca’s (Fashion Show Mall), Stash Clothing (Miracle Mile Shops, Planet Hollywood), Pink Society (Downtown Summerlin), ANGL, Marshall Rousso and upcoming local fashion designers from the Las Vegas Fashion Design Council including: Becca Pahor of BEX, Simone Holmes, CRC, Carina Roman, Marshanay Douglas, Mauricio Montebello, Peter Morales, Rosie Kirby, Agnes August, B. Darricks, Debbie Carrol, and Adaobi Gogo. Bank of George and Zem Media are corporate sponsors for the event. The brainchild of local Nevada business owner, Debbie Landry, “Prêt–à–Porter” (pronounced preta-por-tay) is a French phrase meaning, “ready to wear.” Landry, who serves as president and CEO of Redhead Enterprises and has a history in fashion and beauty, plans to host the event twice a year – once to highlight fall/winter fashions and once to showcase spring/summer clothing. While ready-to-wear fashion shows are nothing new, Landry’s event brings a new concept to the industry. Targeting the fashionista in everyone, the show will feature current fashions (rather than future fashions) that are available for purchase from local retailers and manufacturers at the time of the show. Prêt–à–Porter Las Vegas will showcase fashions available for the modern woman this fall and winter, including where those fashions can be purchased at retail stores. In addition to runway events, Prêt–à–Porter will include a retail vendor fair and more. Event tickets for general admission seating are $44 (one show segment), $123.75 per day (three show segments) or a “fashionista weekend” pass for $165. Cost for VIP tickets range from $165 to an all-access weekend pass for $550. Tickets can be purchased at www.readytowearlv.com or through Ticketmaster. To kick off the festivities, a red carpet VIP event will be held from 7 to 9 p.m. on Friday. Political dignitaries, local celebrities, designers, retailers, sponsors, vendors, Dress for Success Southern Nevada, weekend VIP ticket holders and others are expected to attend. Saturday and Sunday will include two full days of fashion shows, beginning at 10 a.m. and ending at 6 p.m. Friday’s events will be held in the Rio’s Miranda Ballroom, and Saturday and Sunday’s events will be held in the Brasilia Ballroom. The days will be divided into two segments, 10 a.m. to 1 p.m. and 3 to 6 p.m., with several runway shows taking place during each segment. Times are subject to change; visit readytowearlv.com for more information. “High-end fashion shows are generally attended by celebrities, the rich and wealthy, and retail buyers only,” Landry said. “Prêt–à–Porter Las Vegas opens up the excitement of a local fashion runway show event to a different audience that will target fashionistas everywhere, retailers, hair salons, makeup companies and more. Sponsorships and vendor booths for Prêt–à–Porter are available. 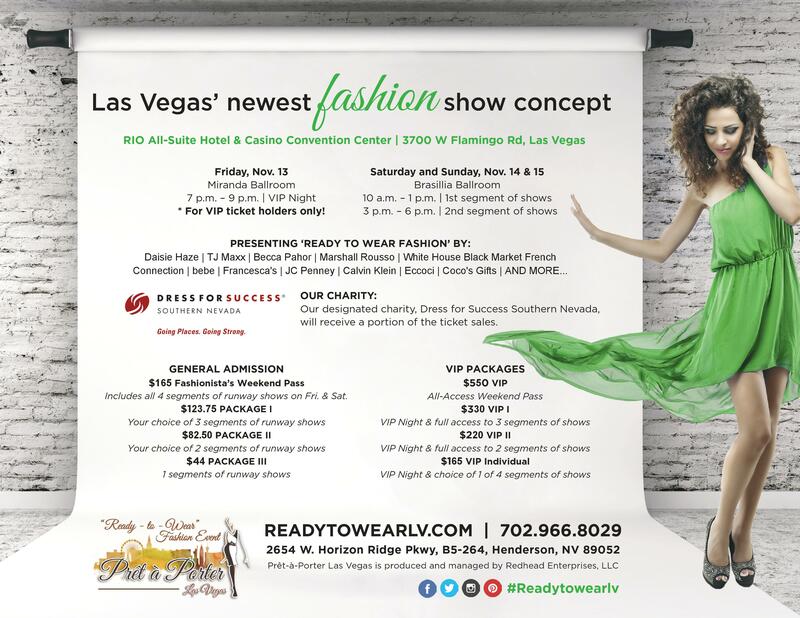 To become a sponsor or vendor, contact Redhead Enterprises at debbie@readytowearlv.com or at 702-966-8029.